Window Shutters are the perfect alternative to curtains and blinds, as they create a sophisticated look in any room of your home. Window shutters are quickly becoming a product of choice, as their elegant look significantly increases the value of your property. 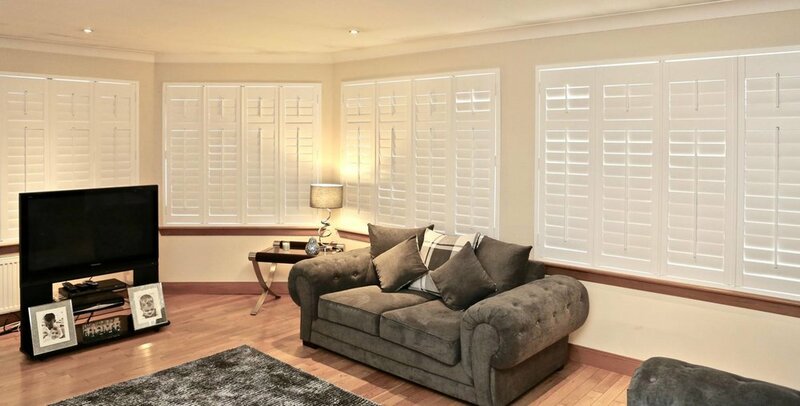 Not only do window shutters add a touch of class to any room of your home, they are also incredibly practical. With window shutters you have full control over the amount of light and privacy you allow in each room of your home. Our range of window shutters come in the finest Basswood or the highest quality HSPVC depending on your requirements. This style is the most popular window shutter as it covers the whole window creating a classic and sophisticated look. Full height shutters come in two sections, each section is easily manipulated, opening and closing the slats for complete light and privacy control. If you’re having tall window shutters installed. our experts recommend a mid-rail section as this will make for a stronger shutter, reducing the risk of any warping occurring. A mid-rail also offers versatile light and privacy control as the upper and lower slats can be opened or closed independently of each other. An extremely versatile style of window shutters, Tier on Tier offers you the ability to switch between full height shutter look, or cafe style shutter look whenever it suits you. The upper and lower panels of Tier on Tier shutters open and close independently, giving you complete control over light and privacy at all times. These shutters are particularly suited to bedrooms as you can block out the light while sleeping, or open the top section of the shutters to allow light in to the room whilst maintaining your privacy. Cafe style shutters are a stylish and practical feature in any room. Cafe style window shutters only cover the lower half of your windows so you can have the best of both worlds with them. They offer you privacy from the outside whilst allowing plenty of light into the room for a bright and airy space. Cafe style window shutters will be fitted up to a certain point in the window, usually at a natural break such as the sashes on victorian windows. However, cafe style shutters are extremely flexible and can be designed and crafted to fit to whatever point you specify for your requirements. These window shutters are perfect for large windows, patio doors or room dividers. The shutter panels glide easily across a discreet smooth operating track system, becoming a stylish feature of the room. Two Track systems are also available. Bifold Track System: Suspended from a top track, hinged panels enable the panels to be folded back to the end of the track at a 90 degree angle.